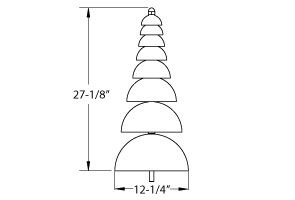 Pagoda Bells are a creative, ornamental accent and instrument that delivers lengthy, lush blended tones. 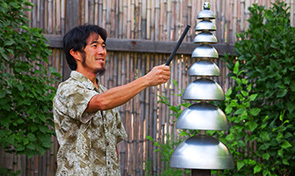 Inspired by ancient Oriental architecture, Pagoda Bells are 8 vertically tiered half-sphered stainless steel bells that are arranged in size order smallest to largest designed to be played solo or simultaneously with a friend, new or old. 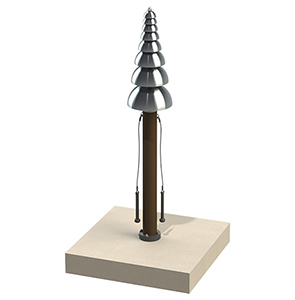 Utilizing ultra-durable, commercial grade materials, the 27-1/8" tall fixture is engineered for outdoor installation—perfect for botanical gardens and community park settings. 2 attached mallets come standard, Pagoda Bells are typically played with 1 mallet unless playing a duet.